← A case of mistaken identity (part 2). 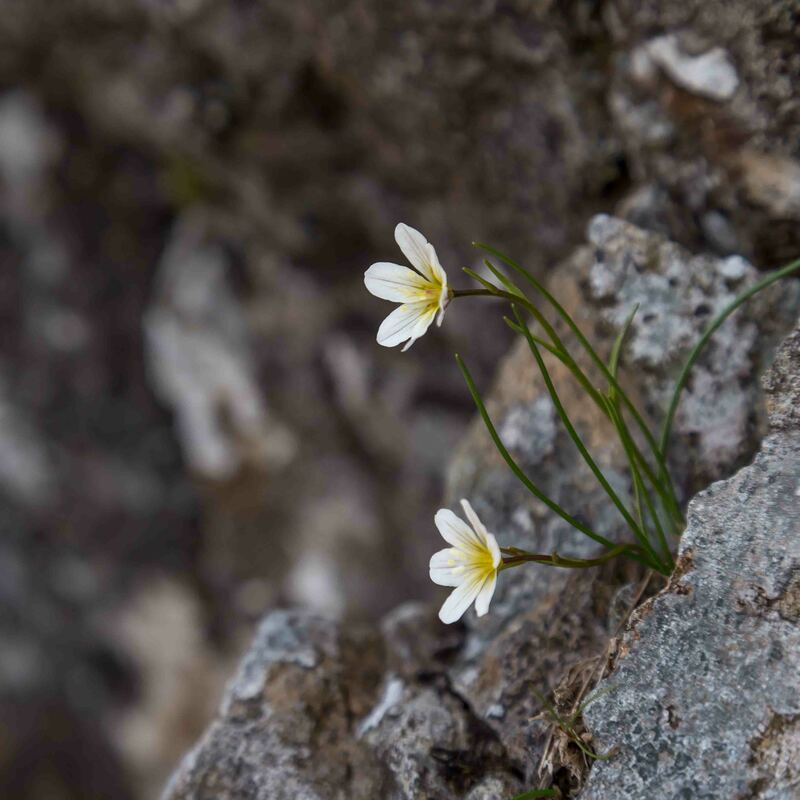 Snowdon Lily, lloydia (gagea) serotina. although he hadn’t seen it in flower. Bill Condry had taken a party of us to see it many years ago, and according to the National Nature Reserve warden for Snowdon it could still be seen in the same location. It was a bit of a slog up to the Snowdon’s great north-facing cliffs. Years ago this would have been a stroll but not so now. Nevertheless I had prepared myself mentally for it and I arrived in good condition. A scattering of small white flowers on a steep grassy slope beneath some cliffs deserved investigation but I eventually put two and two together: despite the altitude those small white cups and those wood sorrel leaves were in some way connected! Arriving at the cliffs I found another plant seeker already there. He quickly showed me two flowering plants of lloydia, one at chest level and another with two flowers at about eight feet up. This was very promising. I spent a couple of hours hereabouts, taking a whole series of images. Access to the twin-flowered specimen was a bit tricky, but I felt that a picture of it would be a bit of a prize. Using my standard zoom at 105 mm, and pre-focussing at the closest distance, I ended up with both feet on the cliff, clinging to it with my right hand, and operating the camera with my left at arms length. Heroic stuff, but it was worth the time I spent contemplating the situation first; the resulting images proved to be the best of the lot. Last week I headed north again to Cwm Idwal, where the well-known (to botanists) “Hanging Gardens” can be found on some broken cliffs high above the lake. Here a bizarre collection of woodland and water plant species jostle with arctic-alpines on lushly vegetated and well-watered ledges. It would not be my first visit but I thought I would have a word with the warden first. We had an interesting conversation about arctic alpines and mountain birds, among other things (see also this post) and then he added “In view of the conditions, I’d advise you not to go up there”. I hung around for an hour or so. There was no sign that the promised heavy downpours were materialising and in fact conditions were slowly improving. I decided to go for it after all. It was a real slog steeply up through the boulder fields to the cliffs, and the hanging gardens proved to be a bit of a disappointment, and not as floriferous as I had remembered them. Early purple orchid could be seen, together with globeflower, water avens and others. Arctic alpines included moss campion and roseroot, but the latter was past its best. 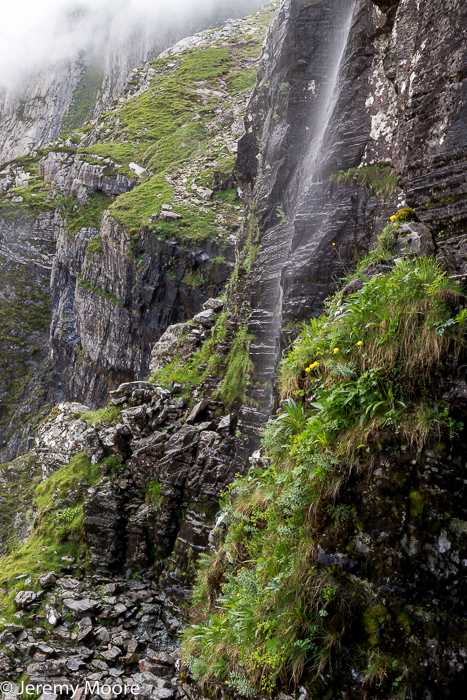 I wedged myself against the rock and took some general shots of the cliff face and its waterfall. I’m no botanist but during my conversation with the warden I thought I’d throw in the word “lloydia” – no more of this Snowdon Lily nonsense! I was disappointed to hear his response – that the species has recently been renamed “gagea serotina”. Apparently the genus “lloydia” is now thought to be identical to the genus “gagea” so all those species currently placed in the former (26 altogether) have been moved to the latter. The name just doesn’t have the same ring to it and if he knew I’m sure Edward Llwyd would be turning in his grave. This entry was posted in Uncategorized and tagged lily, lloydia, photography, plant, serotina, Snowdon, wildlife. Bookmark the permalink. 2 Responses to Edward Llwyd would be turning in his grave. Heroic indeed Jerry! Lovely delicate image.